I travel the world to find unique curiosities and the World Nomad Games had everything I searched for in an experience: a celebration of the region’s nomad past and culture taking place in a far off land. I came as part of a large contingent of over 500 local and foreign journalists covering the 3rd Nomad Games in Kyrgyzstan. National Geographic was there. The New York Times was there. And right alongside them, Where and Wander. “What’s that?” was the most common question I got when I told my friends I was headed to Kyrgyzstan to shoot the World Nomad Games? Prior to arriving, I answered by saying that it’s basically the Olympics of Central Asia, but instead of swimming and volleyball, athletes compete in horseback archery, hunt with falcons, and fight over a dead goat carcass. On paper, that’s exactly what it is, competitive games that were played by the nomadic people of Central Asia. Today, it is a celebration of that past and tradition. The 6 day event takes place once every two years and has been hosted by Kyrgyzstan for the third time now in the Issyk-kul region. This year there were 37 different sports with over 2000 athletes participating from 82 countries. The games, which include sports like Kok-Boru (headless goat polo), Er Enish (horseback wrestling), Salburun (falconry), and Ordo (bocci balls with cow and goat bones) were split between the modern athletic facilities at the Hippodrome and Gasprom Center in Cholpon-Ata and in the open valleys of the Kyrchyn Village about 45 miles away. Kok-Boru, a traditional horse game, is probably the game that most people refer to when they talk of the World Nomad Games, and is in fact the most coveted of the seats, much like the 100 meter sprint at the Summer Olympics. It is also the most eyebrow raising of the games. So what exactly is Kok-Boru? Translated as ‘grey wolf’, the game originated hundreds of years ago in the open plains of Central Asia when hunters defending their herds from wolves would return with the carcasses of the wolves and entertain themselves by playing keep away with those carcasses. The games evolved over the centuries and today is played with the carcass of a dead goat with the aim of getting it to the opponent’s side of the field and tossing it into a giant bowl-like container called a ‘kazan’. It’s a brutal game that requires a lot of strength (to haul a 40kg goat carcass) and skill on horseback (to outmaneuver the other opposing horseback riders). For this assignment, I went analog and left my usual gear at home for a much more simple kit: a Bessa R3A, a Voigtlander 40mm f/1.4 lens, and 30 rolls of 35mm Portra 400 film. 36 shots per roll. One focal length, no zoom, no instant review, and no telling if I got the shot or completely screwed up the focus, exposure or composition. It had been years since I’ve shot on film, so there was certainly some pressure and palpable excitement prior to pressing down on the shutter and exposing that first shot onto the negatives. I would also have to wait until returning home to develop and scan the negatives. The magic of shooting on film is that you can’t fully predict what will happen, and two of my first shots were partially exposed on top of each other from not being properly winded forward. It was a definitely an error, but it also turned out to be one of my favorite captures from the game. Seeing these photographs nearly two months after the games brought back so many memories. With media credentials, I was able to go to the Hippodrome Stadium while preparations were still being made for the Opening Ceremony. Dancers rehearsed their choreography, a large crew of people was putting the final touches on the staging area, and a group of horse riders (including men, women and children) assembled to practice a bit of…of everything. 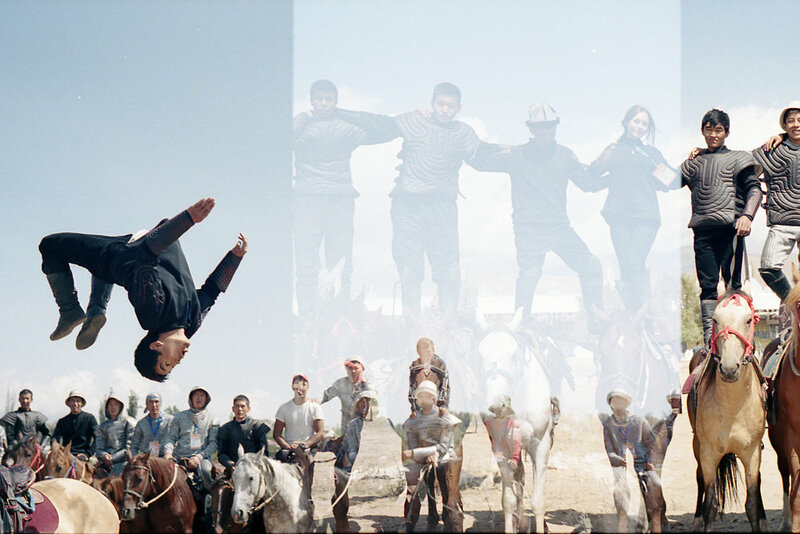 During their break, the riders formed a large circle while different individuals showed off their skills and I had a front row seat to seeing boys back flip off their horses, men wrestling on horseback, and even a rider singing a serenade on the Kyrgyz komuz. 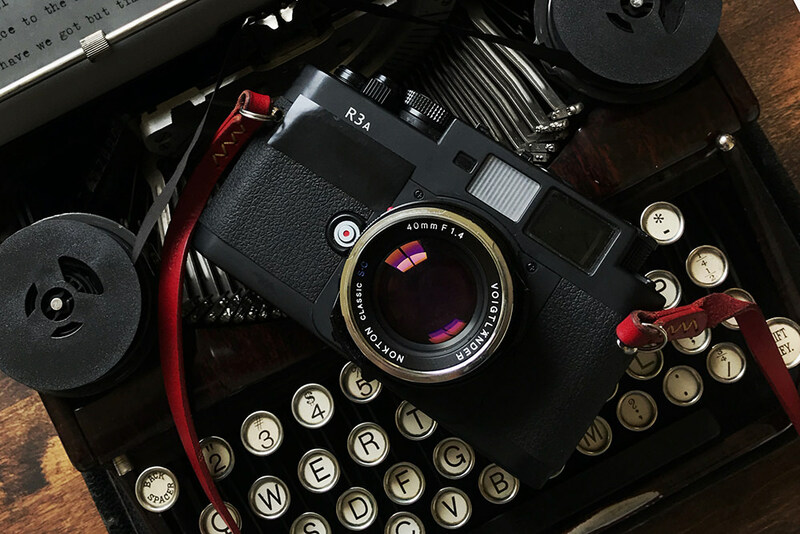 A 40mm focal length on a 35mm film body is the visual equivalent of just being a hair wider than the human eye’s field of attention. In other words, it’s a little wider than what we see in focus with our eyes. It’s a beautifully simple focal length that captures what I see. Not much more and not much less. Uncomplicated. For me, it was always going to be about the people. As nice as it would have been to have a 600mm telephoto lens to capture the brutal detail of Kok-Boru, where two teams of horseback riders fight over a headless goat carcass, I was much more excited to roam around and find the behind the scenes portraits, the in between the action moments, and the frames caught when everyone’s attention is turned elsewhere. The freedom of shooting with one lens, meant I had to really move around to find what I wanted to capture. The limited number of exposures per roll meant I had to be very deliberate about each shot. In the expansive valley of the Kyrchyn Gorge, I had no shortage of subjects to photograph. While the sports themselves were supposed to be the main focus of the Games, I personally found myself more drawn to everything else going on in the village, from the people dressed in traditional clothes putting on a display of the old ways, to the visitors camping out and just passing the time. During the opening and closing ceremonies at the village, I chose to give up my seat in the media section to wander behind the main stage. Much to my satisfaction, I had a much closer view of the people putting on the show. Some practiced and prepared for their parts, but most seemed to just be taking it all in and enjoying the moment just like the visitors. I was lucky enough to walk around with another American photographer, who happened to have volunteer as a peace corp member 10 years back in Kyrgyzstan and learned the language. We were an odd enough pair because I more resembled a local, and yet this white dude from New York was the one speaking fluent Kyrgyz. Everyone loved it and were very happy to let us photograph them naturally. With my normal gear, I could quick focus and capture 10 shots in a few seconds. If I didn’t feel like I had it, I’d fire off another 5 or 10 and I’d know instantly if I got a ‘good enough’ shot. Shooting on film was a much slower process. I’d first have to meter for the light and do a mental adjustment in my head to get the exposure correct. After that, I’d carefully focus and keep everything steady. Only then, can I start to wait for the right moment to pressure the shutter. Every shot mattered. Without a common tongue, I could not ask anything from the people I shot and yet in some ways, they understood what I wanted to capture each time and very few ‘posed’ for the camera. They let me take my time and just take what I saw. What initially felt like a slow and restrictive processed turned into something meditative. When I had to wait for the right shot, it was like waiting for a feeling, or a connection with my subject. I was just as still, looking at them, as they were, looking at me. When I felt like I found it, I released the shutter. We often exchanged a smile only after the exposure was made. I keep those memories for myself. Months later after I’ve processed these images, I found the look on these faces to be as raw and honest as the moment I captured them. I almost never took more than one frame of the same person, so what I saw after the developing the film was the only capture I had. Every shot counted, however imperfect they were. These are the majority of the images I captured on film of the World Nomad Games. They are, in my best effort, my attempt to capture what I saw at the games beyond the actual games themselves. They were of the people who volunteered to dress up in traditional clothes, to play the role of their ancestors, to remind their own people and foreign guests of their history. They were also of the locals that attended the games, and of the many more helped to bring the event together. The event lived up to being one of the most unique experiences I’ve had in my travels. For better or for worse, my story does not end there. My real story of the World Nomad Games and Kyrgyzstan actually began before the start of the Games and continued long after. You can continue the story here.